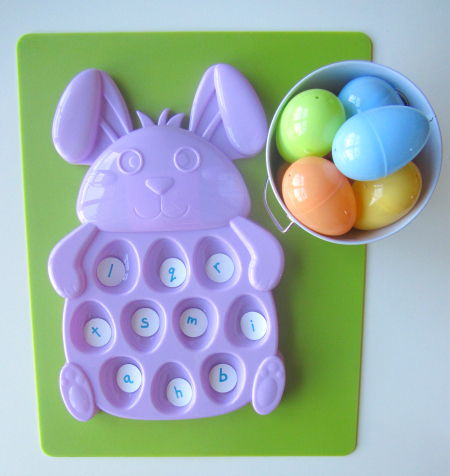 This upper case lower case Easter egg letter match activity is not groundbreaking but combining it with an Easter theme helps makes letter recognition practice and skill development into play. 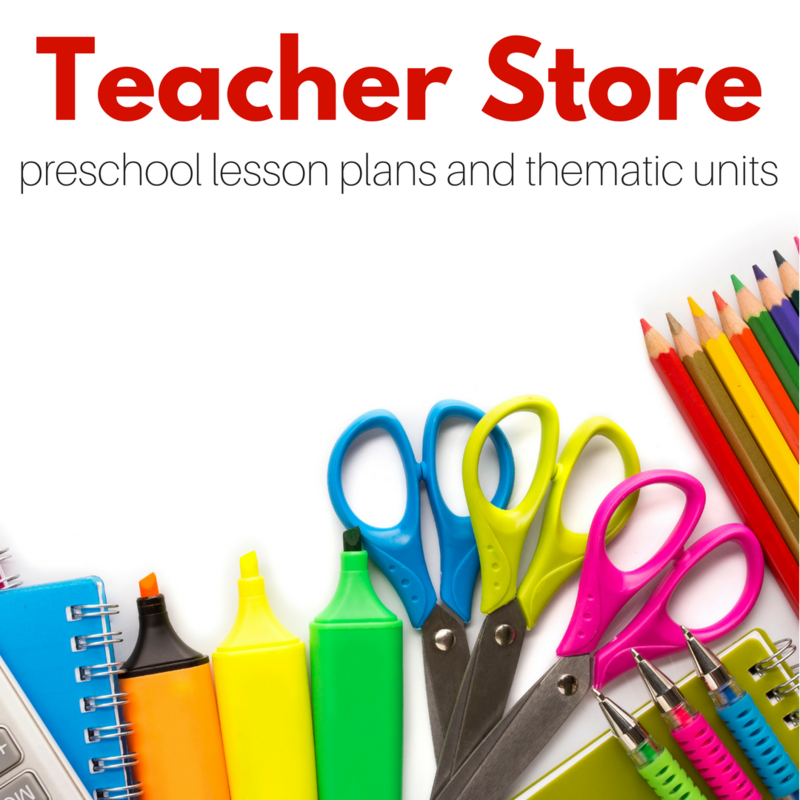 Adding a fun novelty like a holiday theme does wonders for kids motivation and a motivated child is a child ready to learn. 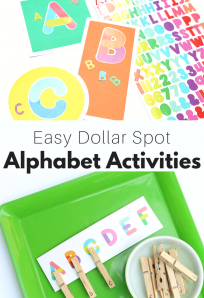 This activity is part of our Alphabet for Starters series which focuses on fun playful ways to learn the alphabet. 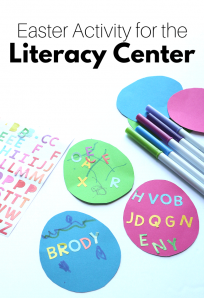 A few easy adaptations for different levels would be doing a straight identical letter match having only all lower or all upper case letters and doing this with sight words for emergent readers. Gather your materials. I got this egg tray at Walmart for under a dollar. I almost bought all 4 colors but I restrained myself and let my daughter pick her favorite color. You could use an egg carton just as effectively no need to buy anything special. 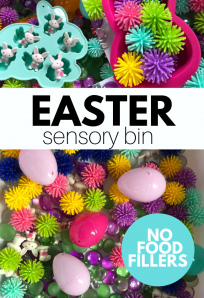 You will also need some paper, marker, plastic Easter eggs and a bucket for the eggs. 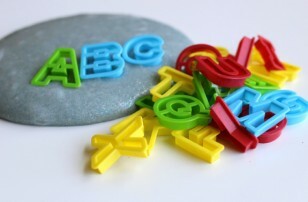 A circle paper punch is optional for the letters in the tray. You may also want some tape to tape the paper in the tray down. Ours got staticky and interrupted the flow a few times. 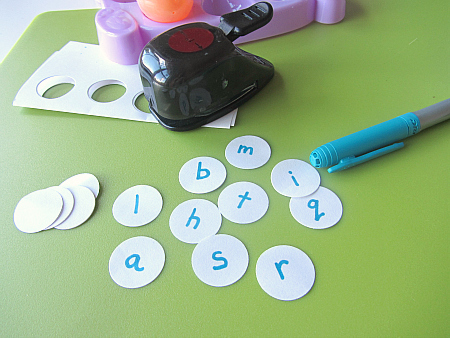 Start by writing lowercase letters on small pieces of paper. 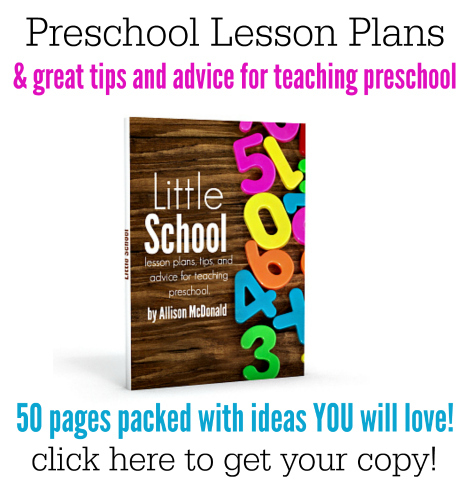 Try to include a majority of letters your child knows (about 2/3) and some you know have been challenging in the past. This will hopefully give them a good balance of “This is challenging but I can do it!” which is the perfect zone for learning. Pop them in your tray. 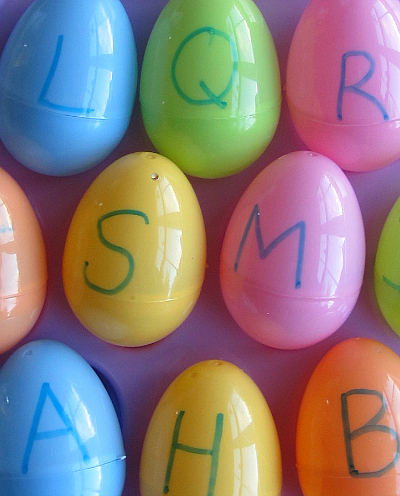 Write the corresponding upper case letters on the eggs in marker. 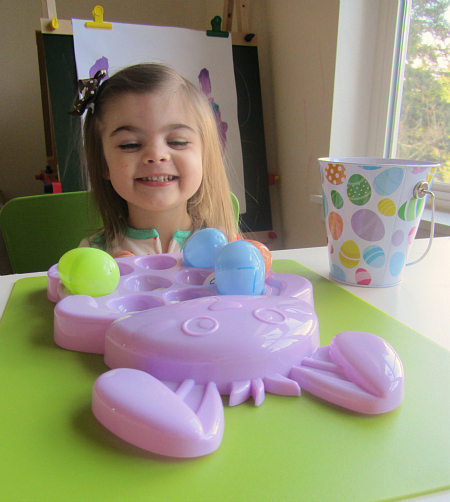 Put the eggs in the bucket and invite your letter matcher to the table. Start matching. 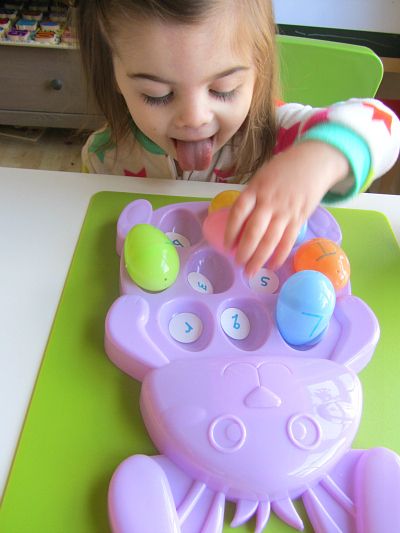 She wanted to put the lowercase letter in the egg after matching them which is a fun add on even though a few of the eggs didn’t want to close back up. Which frustrated her greatly. 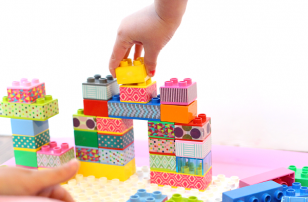 I think an older child would do wonderfully with this add-on even if it proved to be too much for a 2-year-old. It was tricky for her but with some help she got it. After that, it was smooth sailing. I thought Q would give her trouble but she was a champ. Celebrate any and all victories. Where Are Baby”™s Easter Eggs? 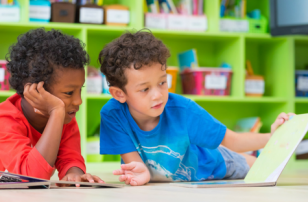 by Karen Katz is a great way of having an Easter egg hunt while reading a story. 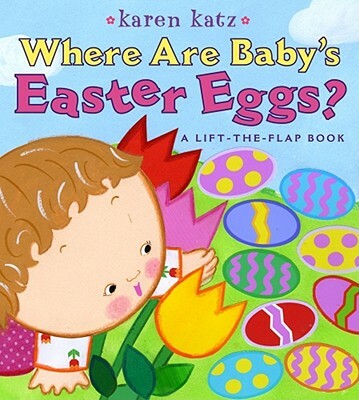 If you aren”™t familiar with the ” Where are Baby”™s ”¦” series of life the flap books, they are simple books where the reader searches for an item finding other things first before finally finding the title object, in this case, Easter eggs. My daughter loves these books and plays with them even when we aren”™t reading them together. I love the bright illustrations and the simple holiday theme. The Best Easter Eggs Ever! 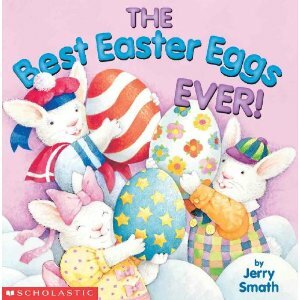 by Jerry Smath is an adorable book about Easter. The story follows the Easter bunny and his 3 young assistant bunnies as they prepare for their big day. 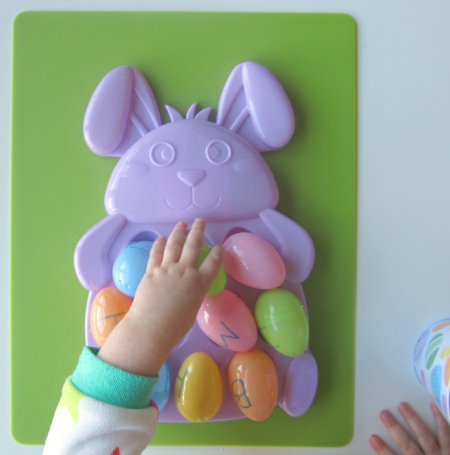 The Easter Bunny is getting tired and a little bored of his polka dot design for the eggs and decides to send out his assistants in search of new designs. 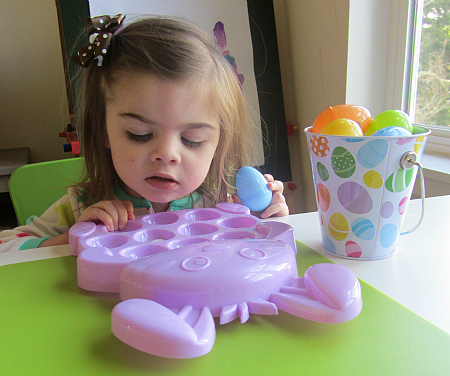 The little bunnies head out with one egg and paints to all different places to find inspiration. When one of the little bunnies is captivated by the night sky she doesn”™t notice how dark it is and how lost she has gotten. 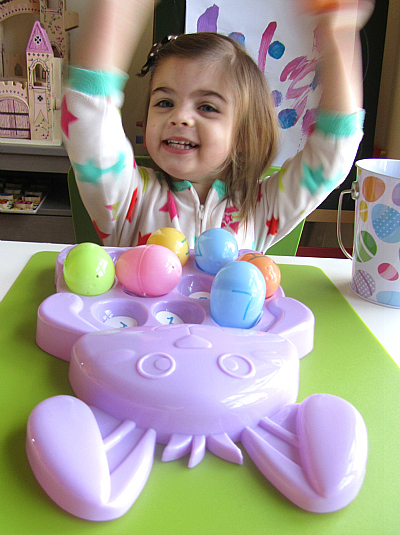 The Easter Bunny and his other assistants find her and in the morning the new designs are celebrated. My son loves an inside look at any sort of secret places like the Easter Bunny”™s or Santa”™s workshop so he was drawn into this book immediately. I liked the illustrations and how detailed they were, it certainly got me excited about Easter. 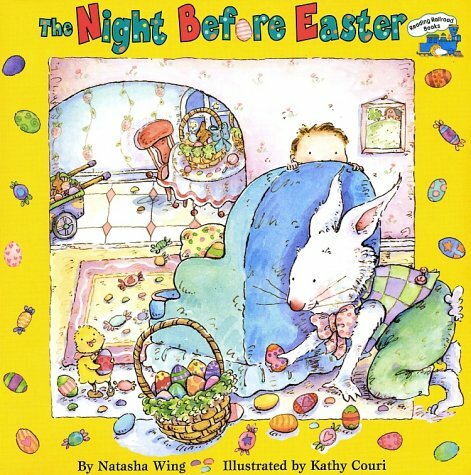 The Night Before Easter by Natasha Wing is an Easter version of the classic “Twas The Night Before Christmas”. With fun pictures and an Easter Bunny so joyful I wanted to apply for his job this book was a hit at our house. My son was engaged through the whole book guessing at the rhymes and listening intently from one page to the next. Of all the books this was the only one that really engaged my toddler as well. She pointed out animals and loved the little boy in the book. Great Easter book. 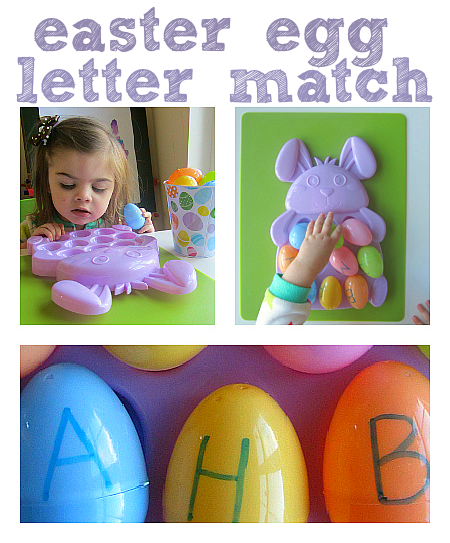 For other fun games like this Easter egg letter match game, make sure to follow me on Facebook! 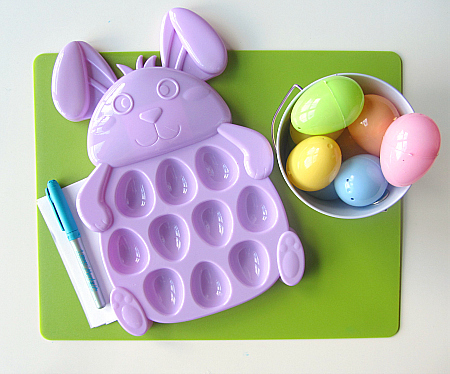 What a super cute egg tray! This is such a great way to work on letters. Just wondering where you got the great bunny mould from. Walmart and they have them again this year!